The National Highway Traffic Safety Administration announced yesterday that they were ending a 27 month investigation into the Ford E Series full size vans over a concern that the HVAC switches were overheating and, in some cases catching fire but after more than two years of work – the feds have those this investigation without requiring a recall on those affected vehicles. The National Highway Traffic Safety Administration investigation of select Ford Econoline, E350 and E450 full sized vans began in late 2009 after the federal safety authority received over a thousand complaints about the HVAC control switches getting hot – hot enough to stop working, melt and in some cases, even catch fire. A few months after opening the investigation into the switch panel in over 1.1 million Ford vans, the case was elevated to an engineering analysis. This step typically leads to a mandated recall but after more than two years of work with those switch panels, the NHTSA has not found any safety defect that requires a recall of these vehicles. 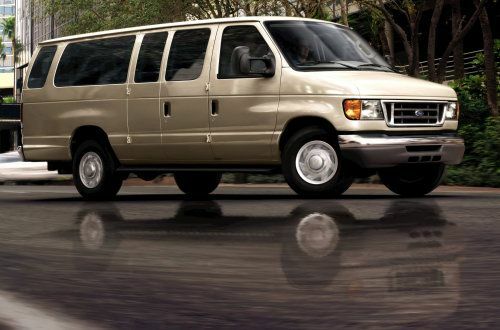 The NHTSA found that when the switches in these 1997-2008 Ford E Series vans begin to fail, they are designed in such a way that there is little chance of the melting components leading to an open flame. That leads you to wonder what exactly happened in the case of the two vehicles that did catch fire but with just two cases out of more than 1.1 million vehicles, it seems like a fairly rare issue and in the opinion of the federal government – not enough to warrant a recall. For the record, there were no injuries in those two reported fires and in the other cases where the switch melted and created smoke, the smoke wasn’t thick enough to prevent the vehicle from being driven safely. Even though Ford Motor Company has not been ordered to recall these full sized vans, the company has taken a few steps to help prevent further issues. First off, Ford has changed the design of the HVAC blower motor switches to help make it less likely to short out, overheat and catch fire on new vehicles. Second, Ford has issued a Technical Service Bulletin (TSB) to dealerships around the country detailing how to repair this issue to prevent any problems in the future, which includes replacing the switch and the electrical connector at the same time in the event that the switches fail. While some owners of the affected vehicles might be unhappy to hear that they won’t be getting their vans fixed for free in the future under a recall order, Ford has pointed out that these hard working full sized vans have traveled somewhere in the range of 128 billion miles and after all of that, just a thousand out of 1.1 million vehicles have experienced a problem with these switches. Ford faced a similar issue about a decade ago where the HVAC switches in select Ford Contour, Mercury Cougar and Mercury Mystique were under investigation for similar melting concerns. In that case, Ford did issue a recall for over 340,000 vehicles but that was due to a resistor problem and not a simple, failing switch. I have a 2010 ford e350 12 passenger van and the switch melted in my van' this is the second time in two different vans both ford e350s. i wouod think the ford needs to man up and replace this defective product. On the date of 16 December 2013 just before 06:00 AM, the 2009 Bus (23 Passenger) E-450 Super Duty Front Heater System over heated and melted the control knob unuseable for the blower and caught fire and destroyed the whole drivers compartment and hot enough to destroy the very rear seats with a hole burned thru the Windshield. The Bus had just been refueled to 50 gallons and could have exploded. The Bus is a total lost Now. The Heater over heating is not a new issue since the Vans from another company that I worked for was also a E-350 control knobs also melted off and became unuseable, but there was no fire in these cases. I have a 2006 E-350 - I have replaced no less than 10 front fan switched. They all have melted and are burnt. My Ford Van Fan Switch heated up and started smoking. The knob fell off and the heater switch no longer works. When the knob fell off I tried to rotate the fan knob and burned my fingers. This is a know issue and it is a safety hazard. Time to take another look!